While I've shown Scottish Folds for 33 years as well as the occassional, American, British, Persian, Exotic, or Ragdoll - I'd only admired "slinkies" from afar. I've always thought they were cool, just never thought I'd want one. 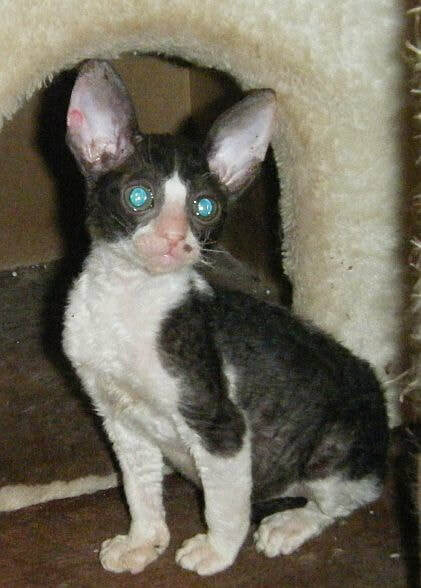 That was, until, I got to handle & play with a friend's Cornish Rex at the shows. We had kittens the same age & since she was handicapped, I would help her getting her girl to the ring. I soon fell in love with their wonderful coat, playful personality & clownish behavior. Every since then I swore that some day I'd have one. 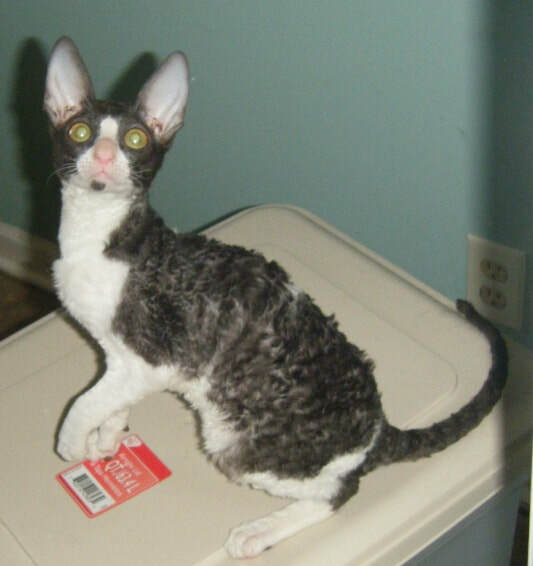 As fate would have it, in June of 2003, I bumped into a friend of a friend - who just happened to breed Cornish Rex. She had this wonderful little white Cornish who I just couldn't resist, try as I might & so it all began. I brought home Rexdancer's Striptease & she took one look at my hubby & my dogs & fell in love & that quickly I lost my new cat. 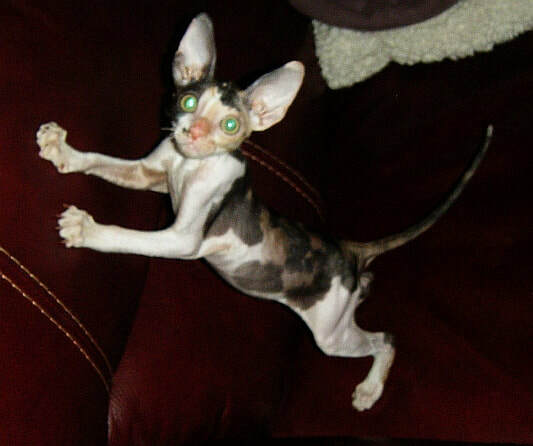 Hubby took one look at her & asked what the heck that "rat thing" was & so Rat was nicknamed. Since she became his & the dog's cat, I decided I needed to get another for myself. Luckily, I had a show down near my friend's home & so went to visit her & all her babies. When I got there, I fell in love with this wonderful little calico baby & everyone know ANYTHING calico is my weakness. Kathy wasn't planning on letting the little one go but agreed to let me buy her if I would have a litter & give her something back & so Taco Kisses - a.k.a RJ (Rat Jr.) came home & my small Rex breeding program & big time love affair with the breed began. 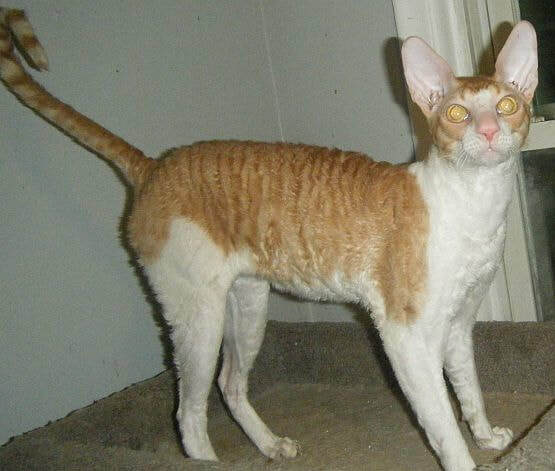 Cornish Rex, like the Scottish Folds, are a natural mutation & like the Folds, their beginning can be traced back to a single cat. In Bodmin Moor in Cornwall England, on July 21, 1950 a red & white male kitten was born who would become the "Susie" of the Cornish breed. Killibunker, as he was named, was one of 5 kittens born to a straight coated tortie named Serena. Serena's owner, Nina Ennismore recognized that he had a "foreign" body (elegant, slinky with a wedge typed head) & a curly coat. 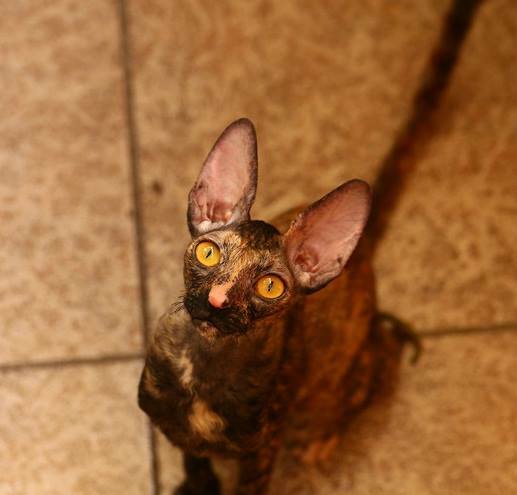 She had worked with Rex rabbits & decided to work with the new mutation in cats. 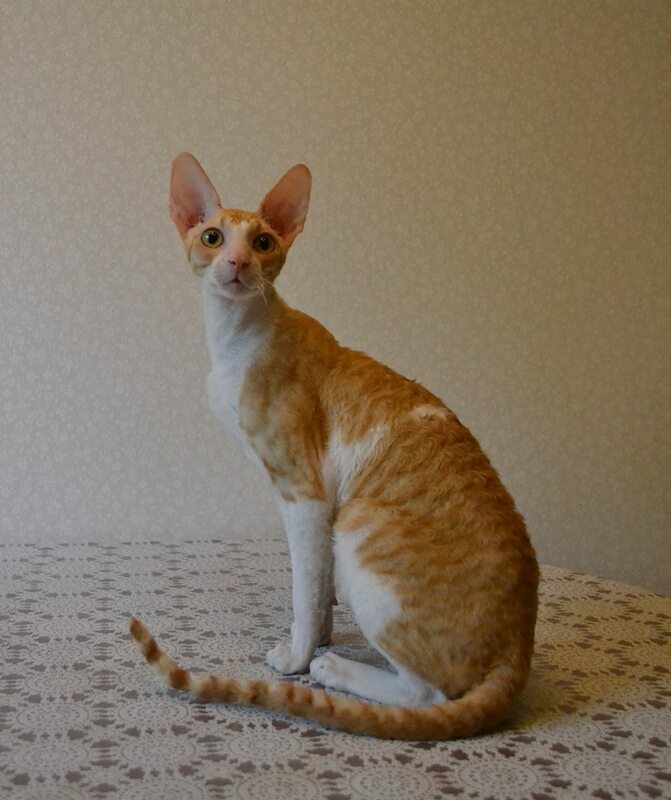 She & a geneticist first bred Killi back to his mom & after keeping a curly coated son, Poldhu continued to breed these two to Burmese, Siamese & British as well as their own progeny. 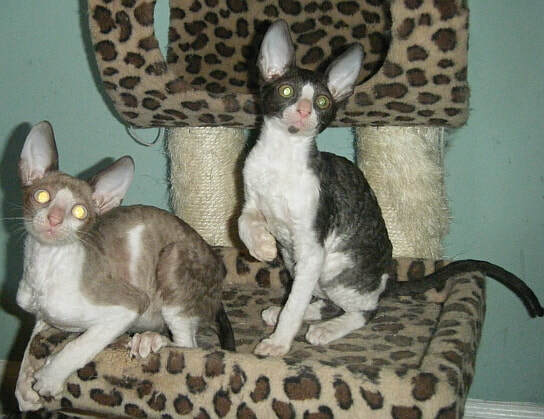 These cats would become the foundation of the Cornish Rex breed. In 1957 Nina sent over a pregnant cat, Lamor Cove, to a breeder in California. Two of Lamora's kittens - Diamond Lil of FanTree & Marmaduke of DazZling are the foundation of the Cornish here in the United States. 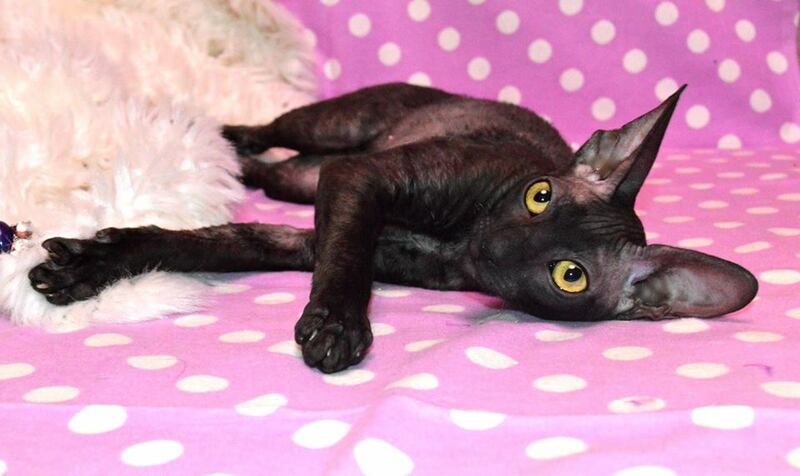 Here they were crossed with Siamese, Burmese, Havana's & American Shorthairs for vigor, big ears & fine boning. In 1962 Marmaduke of DazZling was the first Cornish registered with CFA (Cat Fanciers Association) in the US & in 1963 they were accepted by the CCA (Canadian Cat Association). When TICA was started, in 1979, the Rex came in with Championship status. Right from the start these wonderful cats were a big hit in North America. The Cornish Res is the "Greyhound" of the cat world with a racy body (but not "tubular"), fine boning, long legs tummy tuckup & a long tapered tail. They should have a long graceful neck leading to a narrow head that should look like a sideways egg with a rubber band around the muzzle area. - pinching it into a defined muzzle break. Cornish have a slight roman nose, a strong chin & medium to large oval shaped eyes. Their ears are large & sit high on their heads, but not so high as to appear "muley". Yet, their most outstanding feature is their wonderful short, soft, silky coat which is wavy. Their coat is often compared to crushed velvet or chenille & really has to be felt to be believed. The waves (or Marcelling) cover the entire body from head to tail & should be dense & uniform with a washboard like appearance. Cornish are energetic cats, never outgrowing their kittenish behavior. 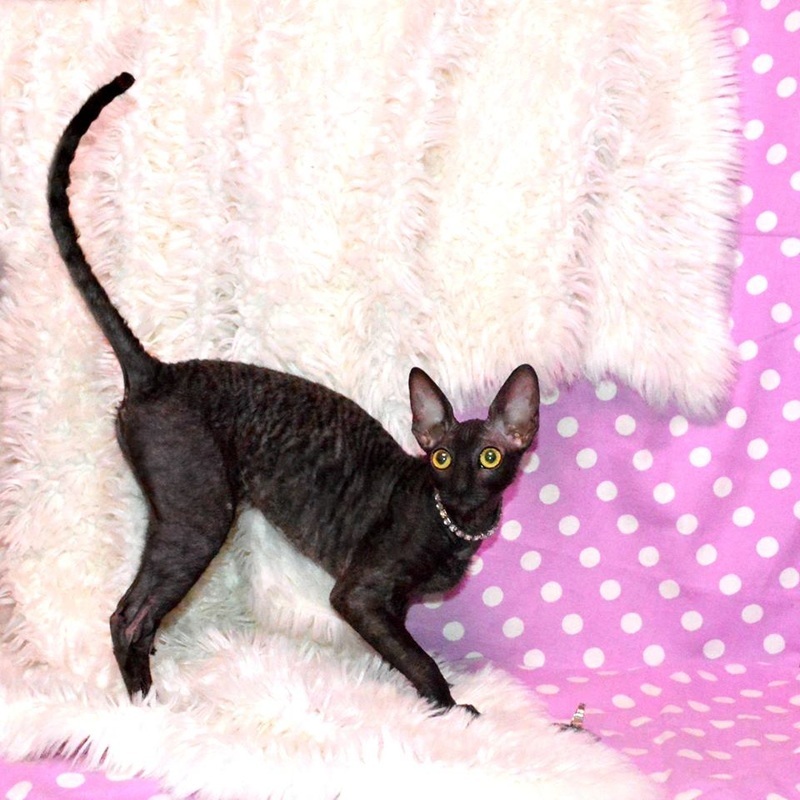 They are active & agile yet love attention & are known for being cuddlers & kissers. They are little clowns that are infinitely entertaining & are quite bright & intelligent. They love to play games like fetch & frisbee, often inventing their own "games". They will actually pick things up with their front paws, which are almost like little hands, & throw them around to entertain themselves. They will work their way into your lives & hearts - so be prepared.